Another Recipe in the Eponymous Epicurean Delights Series! I have been making variations of Brunswick Stew for more than 25 years. It is a very rich, thick stew noted for its signature items of meat, tomatoes, and fresh vegetables such as sweet corn. Brunswick Stew was one of the first stews I ever cooked on an 18th century open hearth at the Square House Museum in Rye, New York. It's a great dish to make because it's almost impossible to get it wrong! 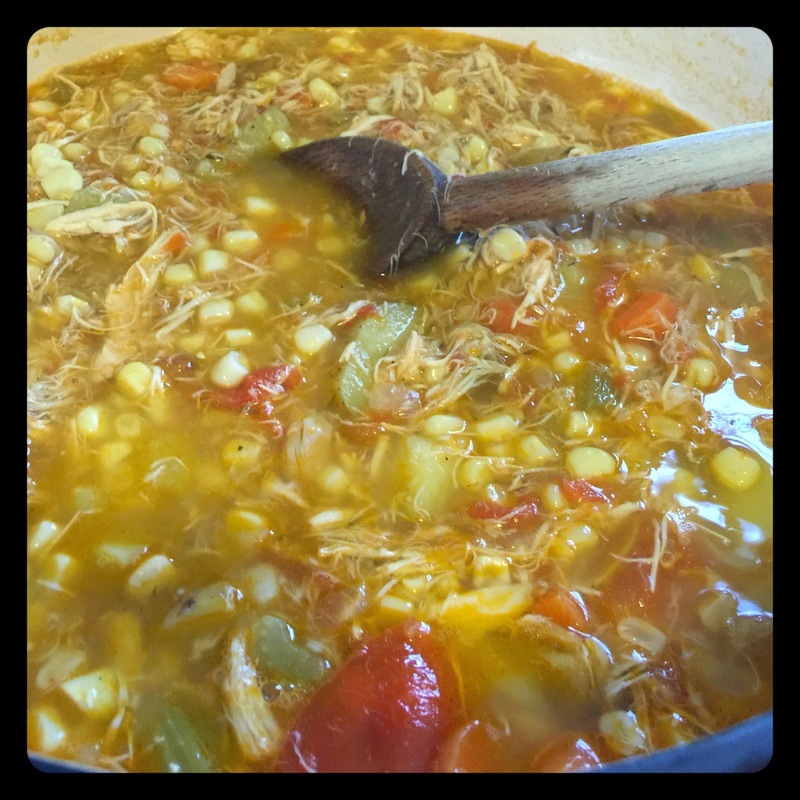 Brunswick Stew is one of those classic folk traditions that occurs in different regions but often times with local variations. Each place known for making it will claim to be the birthplace of the dish, but as with most folk traditions it is frustratingly impossible to pinpoint an exact source for the tradition with any kind of evidence or certainty. "According to local tradition, while Dr. Creed Haskins and several friends were on a hunting trip in Brunswick County in 1828, his camp cook, Jimmy Matthews, hunted squirrels for a stew. Matthews simmered the squirrels with butter, onions, stale bread, and seasoning, thus creating the dish known as Brunswick stew. Recipes for Brunswick stew have changed over time as chicken has replaced squirrel and vegetables have been added, but the stew remains thick and rich. Other states have made similar claims but Virginia's is the first." Supposedly, Dr. Creed served this stew at a fundraiser for presidential candidate, Andrew Jackson. It was supposed to symbolize Jackson's image as a "common man" and was such a hit that attendees of the dinner copied it and made it popular. It makes a good story but who knows if it is true! In Brunswick, Georgia, there is a 25 gallon pot on top of a plinth with a plaque attached stating that it was the vessel in which the first-ever southern favorite, Brunswick Stew, was made in 1898. Lately there are versions of Brunswick Stew attributed to North Caroline, often with the famous vinegar-based BBQ sauce as an ingredient. While there are many who claim to be responsible for this rich, thick meat and vegetable stew, its origins probably go back to the days when Native American Indians lived in the south. In addition, stews were very popular among the farmers who settled the south because they could be made very easily with whatever ingredient was on hand at the moment. Therefore, you will find recipes for Brunswick Stew that still include squirrel, but oftentimes the meat is chicken, pork, or any wild game available. Enjoy my version of this beloved dish. It's so good you won't care where it actually comes from! 1. In a large Dutch oven, place all of the ingredients. 2. Place on the stove over a medium high heat. Bring to a boil and then reduce heat to medium low and simmer for 2 hours. 3. Remove any scum that may rise to the surface. 4. After the cooking time has been reached remove the stock pot from the stove and allow to cool. 5. 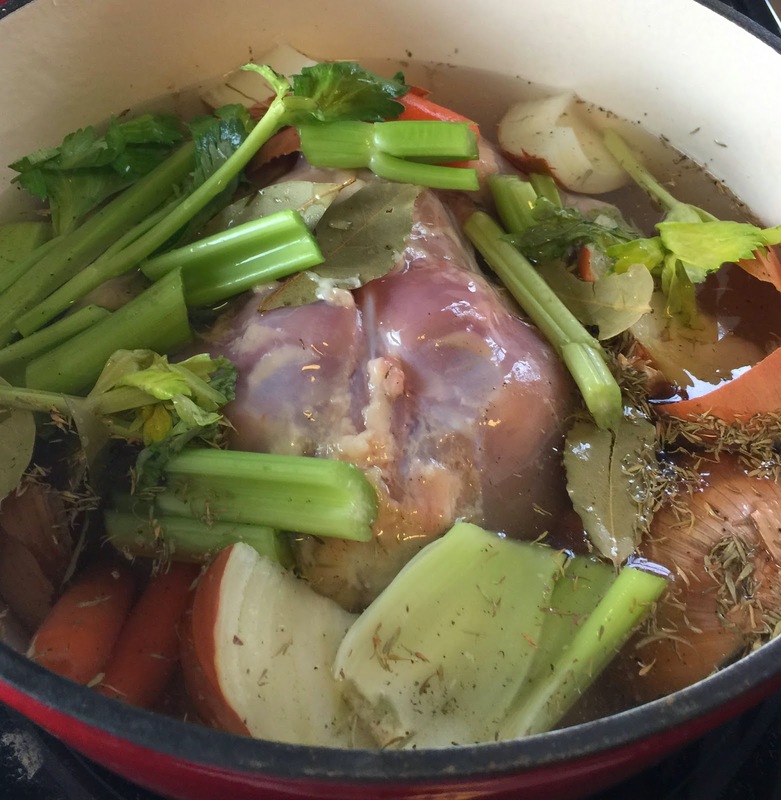 Once the stock is cool, remove all of the large chunks of chicken meat from the bones and set aside for use in the stew. 6. Drain and reserve all of the liquid from the remaining bones and vegetables. Set aside the finished stock until time to make the stew. Remove some of the fat that will settle on top of the stock to prevent your finished stew from being too greasy. 1. In a large stock pot, melt the butter. Add the diced onions and sprinkle with salt (about 1/2 teaspoon or to taste) and allow to cook 8-10 minutes over medium heat, until softened but not too brown. 2. Add the rest of the butter and the diced carrots, celery, and potatoes. (You may substitute the potatoes for butter beans.) Add more salt, pepper, and the thyme. Cook until all of the vegetables are coated with butter and are just starting to get soft, about 10 minutes. 3. Add the reserved chicken meat. Then add enough of the reserved chicken stock just to cover the chicken and vegetables (about half the stock). Bring to a boil then reduce heat to medium low and stew for 1 hour. 4. After one hour of stewing, add the chopped tomatoes. Continue to stew over medium low heat for another hour. 5. Add corn and season with more salt, pepper, and thyme, if needed. Continue to stew for another 45 minutes-1 hour. 5. Adjust seasoning to taste, if necessary. Serve at once. Sally Lunn Bread: Moist and Delicious Every Time!